Today’s journey could be called The Artwork of Steve Head, Part Two. 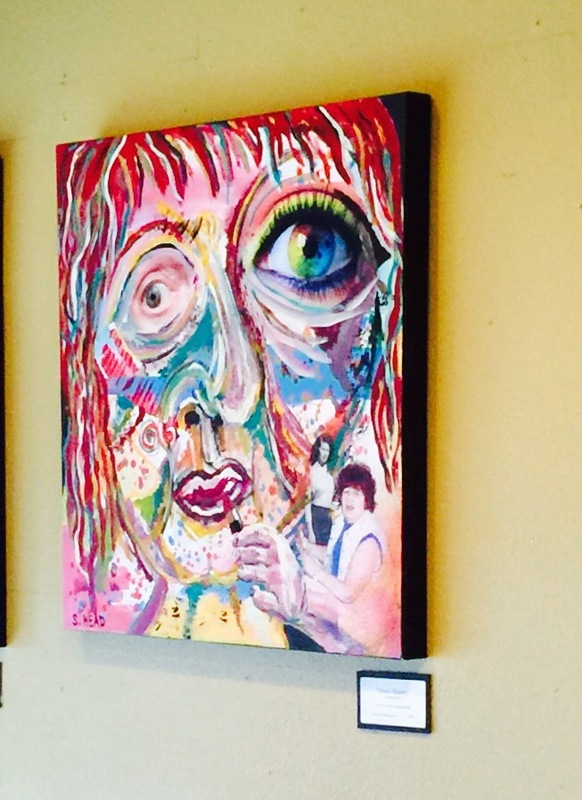 I wrote about Steve Sunday, after visiting his amazing exhibit, titled Family Secrets, currently on display at Joplin Avenue Coffee Company. I had the pleasure of attending an artist talk by Steve this morning, at the same location. 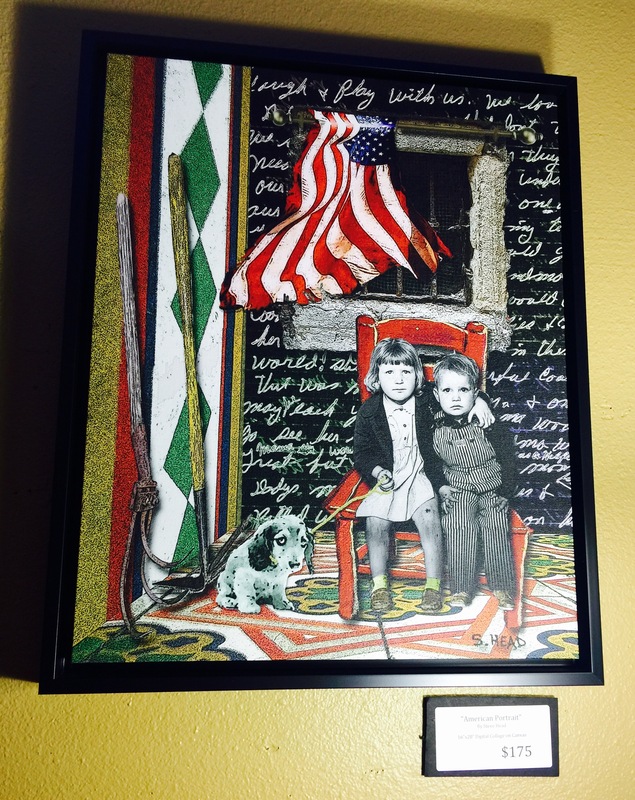 As I shared Sunday, Steve’s art visually tells the stories of his family and his childhood. Steve carried shame throughout most of his life, because of situations in his family history that included alcoholism, poverty, illiteracy and mental illness. What he discovered three years ago, as he began to create his mixed media art collages, was that by bringing those painful family stories into the light, he bathed his own heart and soul in healing light as well. This morning, Steve quietly shared the stories behind the stories captured in his artwork. A hushed group sat around him, deeply respectful of such vulnerability, and emotionally impacted by his words. I heard about Steve’s great-grandfather, featured in the piece, “Bringing Phelix Home”, and his grandmother, Mary, whose story is portrayed in “Lost and Found”. Both family members spent time in a mental hospital in Oklahoma, in the 1920’s and 1930’s. Their lives were hidden in obscurity, until Steve, who never met Phelix or Mary but felt an emotional connection to both, brought them into the light through his art. 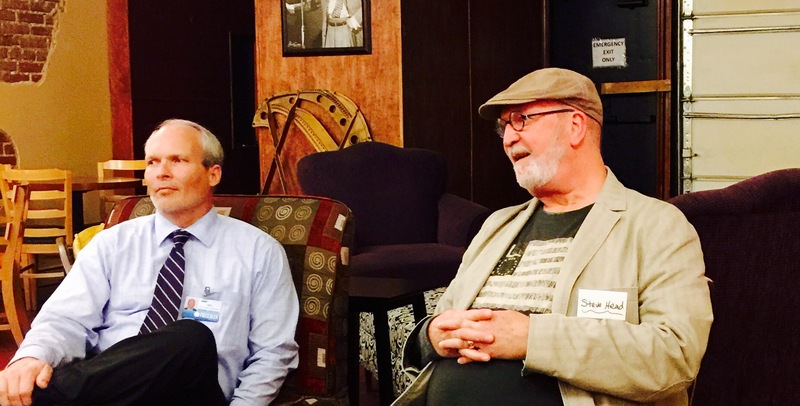 I listened as Steve described his challenging childhood. As a young boy, he wanted to be an artist. In school, he considered himself a B or C artist, rather than an A. He questioned whether he was good enough, talented enough, to succeed. 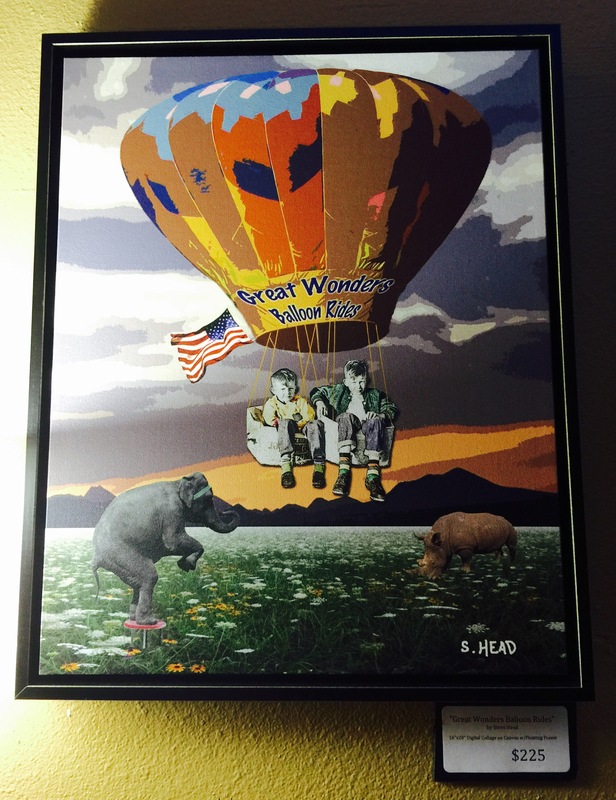 A family member seemed to confirm his doubts, telling him, sarcastically, “Oh, you will do great wonders.” One of my favorite pieces, after today, is “Great Wonders” which captures Steve and his younger brother as boys, sitting in boxes, carried high into the sky by a hot air balloon with those two words printed across it. Thankfully, Steve recently began to explore just how incredibly talented and artistic he is, as he simultaneously delved into his family’s past. As he acknowledged the shame that he carried, recognizing that although outwardly whole, he was inwardly very wounded, Steve sought healing through creative expression by also acknowledging his family. One of the most tender stories told this morning was of Steve’s older sister, Irma, who was diagnosed with schizophrenia at the age of nineteen. Irma eventually became a ward of the state of California, residing in a care facility. As a child, Steve felt uncomfortable and embarrassed when he visited his sister, lacking understanding perhaps, of the devastation the disease afflicted on her. He shared that as a young woman, she was often compared to actresses Rita Hayworth and Lucille Ball. In an attempt to cling to those compliments, and duplicate Lucy’s scarlet lips, Irma would apply lipstick with less than satisfactory results, creating more discomfort in Steve. His art piece, “Irma’s Beauty”, lets the world know that this is his sister and he no longer feels the old shame, but rather love, respect and compassion for her. When one is as courageous as Steve, in so transparently sharing his life, his wounding and his healing, it bestows courage on others. I sat with the weight of his childhood upon me, and then realized it was the weight of my own that I felt instead. Steve shared a quote that said, “You are only as sick as your secrets.” What truth. We all have our secrets. We all have family members that we would rather not talk about. We are all the walking wounded, with hearts and souls pierced by a thousand darts from our childhoods. Seeing Steve’s artwork, hearing of the redemption that he gained, for himself and his family, I considered what that might feel like in my own life if I could shine that bright healing light into some of the dark corners that remain from my own childhood. I feel so inspired to see what creativity can recover and redeem within me. That’s the powerful effect of the artwork of Steve Head. It not only sheds light on his life, but spills over onto all who spend time gazing into his art, into stories that, at a soul level, represent us all.